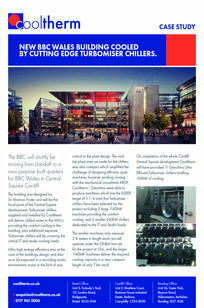 COOLTHERM FLIES HIGH WITH BESPOKE SOLUTION. The BBC will shortly be moving from Llandaff to a new purpose built quarters for BBC Wales in Central Square Cardiff. The building was designed by Sir Norman Foster and will be the focal point of the Central Square development. Turbomiser chillers supplied and installed by Cooltherm will deliver chilled water to the AHU’s providing the comfort cooling to the building, plus additional separate Turbomiser chillers will be covering the critical IT and studio cooling loads. Ultra-high energy efficiency was at the core of the buildings design, and also as to be expected in a recording studio environment, noise or the lack of was critical to the plant design. The roof top plant area set aside for the chillers was also compact which amplified the challenge of designing efficient, quiet machines, however working closing with the mechanical consultants ARUP, Cooltherm - Geoclima were able to produce machines which met the ESEER target of 5:1. In total five Turbomiser chillers have been selected for the project including 3 large 1140kW machines providing the comfort cooling, and 2 smaller 260kW chillers dedicated to the IT and Studio loads. The smaller machines only measure 2.4 meters in length each, but still operate under the 58dbA limit set for the project at 10m, and the larger 1140kW machines deliver the required cooling capacity in a very compact length of only 7.6m each. On completion of the whole Cardiff Central Square development Cooltherm will have provided 11 Geoclima Ultra Efficient Turbomiser chillers totalling 10MW of cooling.